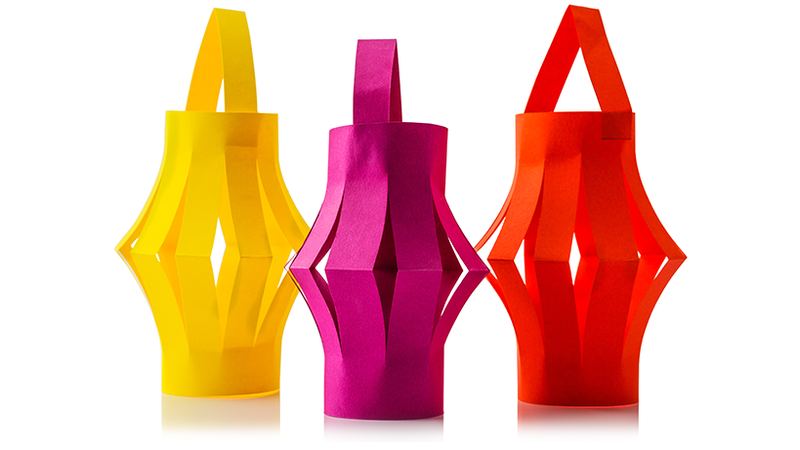 Craft paper in contrasting colors or patterns (2 sheets per lantern) cut to size: roughly 30 x 30cm. We recommend one decorative paper for the outer layer, and one plain color for the inner layer. Note: If your child is making this craft, please be sure to supervise them while they’re using scissors. Cut base paper in half – Fold in half and cut. You can use the halves to cover two toilet paper rolls – one per roll. Measure and size to fit roll – Wrap the craft paper around the toilet paper roll to measure and cut off any excess. Wrap around roll and glue – Secure the paper around the tube using glue dots. We used about six to get the job done. Measure and cut outer paper – Using a contrasting craft paper, lay your covered roll on the paper to measure the amount needed. Cut enough to wrap around the roll once. This paper will become your “outer paper”, so ​it should be the more decorative paper. Fold and cut outer paper – Take the outer paper strip that you’ve just measured to size, and fold in half lengthwise. Cut slits across the fold. Start cutting your slits about an inch from the edge. The more slits you have, the more of the inner roll cover you will see. Wrap outer paper around roll – Wrap the outer paper around the covered roll. Pinch the edges towards the middle to make the slits pop out. Staple the outside cover to the toilet paper roll. Attach handle – If you want to make a handle for your lantern, measure and cut a length of ribbon of your choice. The length of the ribbon can be as long or as short as you want it to be. Use glue dots to attach the ribbon to either side of the lantern at the top.